Poster does not come framed. Please inquire for Framing here. 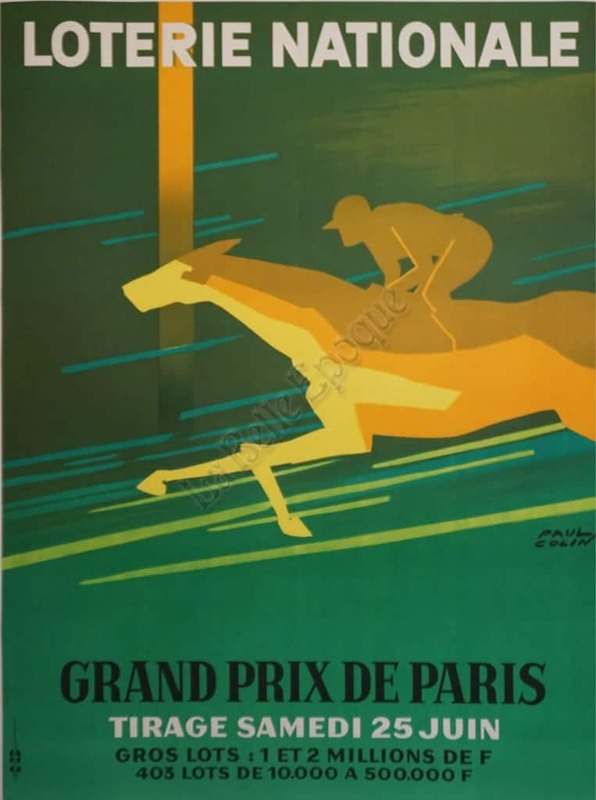 This is a French Mid-Century Modern period advertising poster for Loterie Nationale Grand Prix de Paris by Paul Colin. This magnificently designed poster features the abstract Silhouette of a horse and its jockey emerging from the right side of the image, depicted in bright yellow and oranges. Running horizontally across the centre of the poster, and surrounding the central image, are bright multicolored green brush-stroke like lines. The contrast of the bold colors of the image with the dark green colored background, and the brush-stroke like lines surrounding the hard lines of the horse and jockey, creates a wildly dynamic image. The white and black typography at the top and bottom of the poster perfectly frames this Mid-Century Modern period poster for the Loterie Nationale by Paul Colin. Printed in France, 1966.